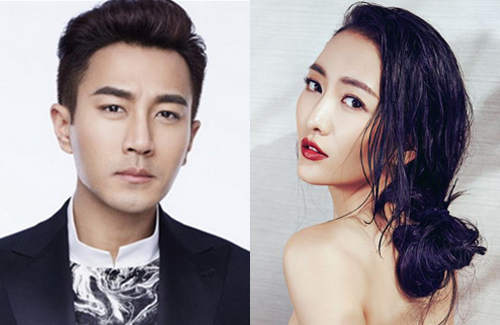 Since their marriage in 2014, 42-year-old Hawick Lau (劉愷威) and 30-year-old Yang Mi (杨幂) were frequently rumored to be in discord. Due to their filming schedules in Mainland China, the couple is often separated and left their two-year-old daughter under the care of Hawick’s parents in Hong Kong. The couple’s relationship came under scrutiny again when reports of Hawick’s alleged affair with his Desolate Era <莽荒紀> costar 34-year-old Angel Wang (王鸥) surfaced on November 10. Reports claim that the costars secretly met up twice inside a darkened hotel room over the span of three days. On the first night, Hawick was inside Angel’s room for four hours. On the second night, he stayed for two hours. Displaying a united front, Hawick denied the rumors through his Weibo, while Yang Mi, expressed her confidence in her husband. Although he admitted to meeting with Angel, Hawick asserted that the costars met in the hotel room only to go over the script together. Hawick’s company quickly issued a warning letter a mere half hour later and threatened to pursue legal action against the tabloid, claiming that the reports severely damaged the 42-year-old actor’s image and reputation. Hawick claimed that it was necessary for the co-stars to meet after filming hours to discuss the script, which is subject to daily revisions by the production crew. Hawick’s quick retaliation against the rumors led to speculation that the report may hold some truth. Hawick committed a rookie mistake. Gee, I can’t see a more appropriate place to go over scripts than a hotel room with no other production personnel present. LOL! How ridiculous are those tabloid writers in suggesting something hanky panky going on. boy, that Yang Mi has gotten herself in some mess by marrying this dead-end uncle. Hawick looks like some Korean actor from the picture above. This chick ain’t that pretty she’s just ok looking. His wife are more prettier. @asian2015 PS to death- plastic surgery as well as photoshopped. Nvr liked this guy. Lousy actor who just got lucky in mainland. it’d be funny if he does sues and loses. @m0m0 it’s strange isn’t it? why does he get into such mess all the time? do you see other actors getting into such trouble? @m0m0 I think the tabloid would be delighted if he really follows up on his threat to sue. Just imagine during the discovery phase: all kinds of dirt would come out as the tabloid would no doubt pull out all the stops to squeeze everything out of him and his “friends”. Besides, the bar for this kind of suit is fairly high as he has to prove beyond a reasonable doubt that the tabloid had the intention to harm him. It would be a win /win for the tabloid and a lose/lose for this old loser. why cheat on Yang Mi, this girl isn’t even worth it. poor decision by hawick lau. Never a fan of this couple…they really don’t seem to be a loving couple…so I’m not surprised if the above report is true. This couple should learn from other celebrity couple like Moses & Aimee in terms of sustaining a happy celebrity marriage & parenthood. For some viewers who think that Moses’ acting is wooden…what about this Hawick Lau whom i don’t think is any better (if not worse)? Despite the hectic filming schedule/job obligations at TVB, Moses still able to play his role as a husband & father pretty well. Meanwhile, his wife (Yang Mi) also has a lot to learn on how to be a better mother. I remembered to have read a report about her only able to spend few hours with her family on her daughter’s birthday. Well, as a mother, couldn’t she at least make some efforts to spend more time with her daughter on special occassions since her daughter hardly see her when she’s busy working elsewhere most of the time. It’s not like asking her to sacrifice (for her child) more than Aimee or even Linda Chung…just putting that little extra effort as someone’s mother. @diana80 I agree with you. I think with with Hawick and Yang Mi, one of the biggest problems is that their priorities are in the wrong place – it’s pretty obvious that they put their careers and work ahead of their family. While there’s nothing wrong with that by itself, it does become a problem when children are involved, since becoming parents brings with it a whole set of responsibilities and priorities that should not be neglected. If we look at majority of the celebrity couples out there who decided to have children, almost all of them had at least one parent put their career on hold (whether temporarily or permanently) or reduce their workload significantly in order to focus on taking care of the child – with this couple, it is completely opposite in that both parents still maintain active careers with no intention of slowing down and so the responsibility of raising the child falls on the grandparents. To me, the fact that neither Hawick nor Yang Mi is willing to make that type of sacrifice for each other or for their child – especially when they are absolutely in a position to do so given that both are well-off financially – kind of makes me question how much they truly love each other and also whether their marriage will last. I’m also doubtful about their love towards each other.